I'm having difficulties installing Apache Solr. The latest version that I downloaded was 4.6.0. But all Drupal documentation and tutorials (see http://www.youtube.com/watch?v=ori-VvvH1Aw) are talking about 3.5.0. While 3.5.0 is nowhere to be found on internet, 4.6.0 has a totally different directory structure, and there is no documentation on how to install this latest version on a server or on a local WAMP. There is no mentioning of which Apache Solr versions are most recommended to work with Drupal? Any help? You aren't alone I had to scour the internet and read several articles before I truly understand all of this. I tried about three different methods until I finally got it right! Once this is done you can get to http://localhost:8080 and see that's it is all running properly. Note: It's recommended to push the port to another one since 8080 is pretty common. If you want to do that use this code for that! You should be able to go to http://localhost:8983/solr and see a new core instance available! Now you can go ahead and configure drupal to point to that. Note: Your new core is located at http://localhost:8983/solr/!!yourcorename!! to be used in the Drupal ApacheSolr module. The issue contains a number of links to sandbox sites and tutorials. This walk-through assumes you already have Tomcat installed. If you don't it is probably easier to just use WHM and install it there and rebuild apache. Point and click is what I say. You should see the default Tomcat page. If not, ask someone for help. If you don't, you are hurting the next person who comes along with the same issue. If we didn't want to help we wouldn't be Open Source. Download your a copy of Solr. If you don't know where to get it, google it. in sshd and get to your directory. I will be using the /lib directory for my example. If you don't have one, create it with mkdir /lib command. Extract Solr to temporary location, for my sake, I just get the zip file from Solr mirrors. Rename your war file for ease of use. The two values you should be customizing are Context::docBase (to point to your .war file) and Environment::value (to point to your solr directory). Note that in this example the .war file is in the solr directory, which is a fine pattern to follow. If you are using Nutch then go here and install/configure nutch. For Apachesolr in Drupal 6.x, see: Setup Drupal 6.x with Apache Solr on Tomcat6 and Ubuntu. All solr version should work with Drupal as long you've module which supports it. For example Apachesolr module, has configuration files for: Solr: 3.x and 4.x. For Search API Solr Search module, you can find the configuration files for Solr: 3.x, 4.x and 5.x, so it shouldn't be a problem. How to install Solr, it's another thing. There are many ways of doing it. Few examples below. Use Puppet manifest to install Solr. 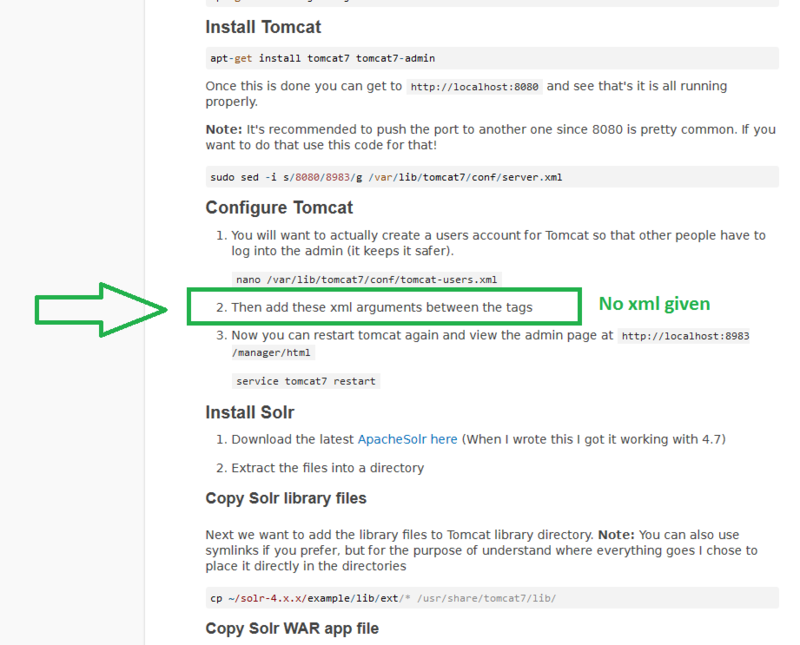 Here is one solr4-tomcat.pp example. $ VER=4.10.4 # Solr version. Deploying procedures for GNU/Linux distros based on Debian. Search API vs Apache Solr Search Integration in Drupal 7?